Do you want to get a lean, muscular body with less fat and a rock-hard stomach? To get in shape and stay in shape using simple, powerful techniques? Body changes don’t happen overnight. They take time, dedication, and willpower. You need to find the strength of mind to eat right and exercise regularly, sticking to your regime with dogged determination. You need to do whatever it takes to lose excess weight and bulk up muscle mass. And you can learn how to do all of that in just a few hours – with help from hypnosis. 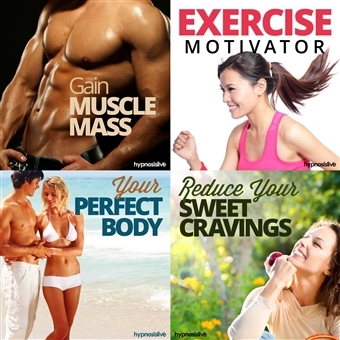 The four motivational sessions in the Gym Body Hypnosis Bundle will help you target key areas that will encourage you to lose your craving for sweets, feel the urge to exercise every day, and see your perfect body take shape before your very eyes. Infuse your body with the habits needed to boost muscle mass and look great. Create the perfect mindset for muscle growth, increasing your muscular potential with each passing day. Feel motivated to achieve great results almost effortlessly, just by listening and opening your mind to the possibilities. Motivate yourself to excel through exercise, replace bad habits with good ones, and target optimal muscle gain. You’ll jump out of bed eager to get moving, craving that intoxicating endorphin rush. You’ll love the feeling you get after you exercise, and you’ll learn to change your thinking to seek it every day. Become enthusiastic and motivated to exercise daily! Reprogram your mind to be happy with what you see in the mirror. You’ll begin to recognize yourself as the perfect person you are, building healthy habits and visualizing your future successes. You’ll generate new lifestyle patterns that force you to think and act in a healthier way. Get the perfect healthy body you deserve! Dissolve sweet cravings, install new eating habits, and realign your thinking to consume only healthy, muscle-building foods. Train your subconscious mind to help you avoid sweets and to start eating healthy food that nourishes and sustains you. Beat sweet cravings for good! Download Gym Body Hypnosis Bundle now to transform your body and find the motivation needed to keep it in tip-top shape. Get the Physique You Deserve, with Hypnosis!